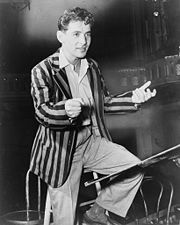 Leonard Bernstein (pronounced "Bern-styne") (August 25, 1918 – October 14, 1990) was an American composer, pianist, and conductor. He was the first conductor born in the United States of America to receive world-wide acclaim, and is known for both his conducting of the New York Philharmonic, including the acclaimed Young People's Concerts series, and his multiple compositions, including West Side Story, Candide, and On The Town. Bernstein was one of the first classical musicians to recognize the power of television as a vehicle to educate the masses, and he did so with an almost evangelical zeal. His commitment to teach and mentor young conductors at the Tanglewood Institute of Music remained his passion until his death in 1990. Commenting on musical poetics and the "redicovery and reacceptance of tonality" in the Harvard Lectures given in 1973, he stated: "I believe that no matter how serial, or stochastic, or otherwise intellectualized music may be, it can always qualify as poetry as long as it is rooted in earth…and that the expressive distinctions among [new] idioms depend ultimately on the dignity and passion of the individual creative voice." Bernstein was born in Lawrence, Massachusetts, in 1918, to a Jewish family from Rovno, Ukraine. His grandmother insisted his first name be Louis, but his parents always called him Leonard, as they liked that name better. He had his name changed to Leonard officially when he was fifteen. His father, Sam Bernstein, was a businessman, and initially opposed young Leonard's interest in music. Despite this, the elder Bernstein frequently took him to orchestral concerts. At a very young age, Bernstein heard a piano performance and was immediately captivated. He began learning to play, after his Aunt Clara gave the Bernsteins her piano when she was moving due to a divorce. As a child, Bernstein attended the Garrison and Boston Latin School. When his father heard about the piano lessons he refused to pay for them, so Bernstein taught young students himself and used that income to pay for his own piano lessons. After graduation from Boston Latin School in 1935, Bernstein attended Harvard University, where he studied music with Walter Piston and was briefly associated with the Harvard Glee Club. After completing his studies at Harvard, he enrolled in the Curtis Institute of Music in Philadelphia, Pennsylvania, where he received the only grade of "A" that Fritz Reiner ever awarded in his class on conducting. 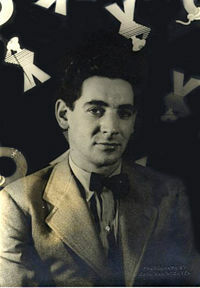 During his time at Curtis, Bernstein also studied piano with Isabella Vengerova and Heinrich Gebhard. He was highly regarded as a conductor of numerous concerts, featuring many of the world's leading orchestras, a composer of three symphonies, two operas, five musical theaters or musicals, and numerous other pieces; yet, he is especially known for composing the music for West Side Story. Additionally, he was a pianist, an educator, and the music director of the New York Philharmonic Orchestra. In 1940, he began his study at the Boston Symphony Orchestra's summer institute, Tanglewood, under the orchestra's conductor, Serge Koussevitzky. Bernstein later became Koussevitzky's conducting assistant. He would later dedicate his Symphony No. 2 to Koussevitzky. On November 14, 1943, having recently been appointed assistant conductor of the New York Philharmonic Orchestra, he made his conducting debut when Bruno Walter fell ill. He was an immediate success and became instantly famous, largely due to the fact that the concert had been broadcast to a national radio audience. The soloist on that historic day was Joseph Schuster, solo cellist of the New York Philharmonic, who played Richard Strauss's Don Quixote. Since Bernstein had never conducted the work before, Bruno Walter coached him on the piece prior to the concert. It is possible to hear this remarkable event thanks to a transcription recording made from the CBS radio broadcast that has since been issued on CDs. After World War II, Bernstein conducted the New York City Symphony (along with Leopold Stokowski) and his career on the international stage began to flourish. In 1949, he conducted the world premiere of the Turangalîla-Symphonie by Olivier Messiaen. After Serge Koussevitzky died in 1951, Bernstein took the position of head of the orchestral and conducting departments at the Tanglewood Institute, an association that continued until his death in 1990. In 1951, Bernstein conducted the Boston Symphony Orchestra in the world premiere of Charles Ives' Second Symphony. The composer, too old and frail to attend the concert, listened to the broadcast on the radio with his wife, Harmony. They both marveled at the enthusiastic reception of this symphony, which had actually been written between 1897 and 1901, and never performed prior to this occasion. Throughout his career, Bernstein did much to popularize the music of this uniquely American composer. Bernstein was named Music Director of the New York Philharmonic in 1957 and began his tenure in that position in 1958, a post he held until 1969. He became a well-known figure in the United States through his series of fifty-three televised Young People's Concerts for CBS, which grew out of his Omnibus programs that CBS aired in the early 1950s. His first Young People's Concert was televised only a few weeks after his tenure as principal conductor of the New York Philharmonic began. He became as famous for his educational work in these concerts as for his conducting. Some of his music lectures were released on audio recordings, with several of these albums winning Grammy awards. To this day, the Young People's Concerts series remains the longest running group of classical music programs ever shown on commercial television. They ran from 1958 to 1972, and are currently available in the DVD format. In 1947, he conducted in Tel Aviv for the first time, beginning a life-long association with the people of Israel. In 1957, he conducted the inaugural concert of the Mann Auditorium in Tel Aviv and subsequently made many recordings there. In 1967, he conducted a concert on Mt. Scopus to commemorate the reunification of Jerusalem. In 1959, he took the New York Philharmonic on a tour of Europe and the Soviet Union, portions of which were filmed by CBS. A major highlight of the tour was Bernstein's performance of Shostakovich's Fifth Symphony, in the presence of the composer, who came on stage upon the conclusion of the concert to congratulate Bernstein and the musicians of the New York Philharmonic. Upon retuning from their Russian tour, Bernstein and the Philharmonic recorded the symphony for Columbia Records at Symphony Hall in Boston. In 1960, Bernstein began the first complete recordings of all nine completed symphonies of Gustav Mahler, with the blessings of the composer's widow, Alma. The success of these recordings, along with Bernstein's concert performances, greatly revived interest in Mahler, who had been music director of the New York Philharmonic from 1904 to 1907. In 1966, he made his debut at the Vienna State Opera conducting Verdi's Falstaff (production by Luchino Visconti with Dietrich Fischer-Dieskau as Falstaff). In 1970, he returned to the State Opera for Otto Schenk's production of Beethoven's Fidelio. In 1986, the State Opera had Bernstein conducting A Quiet Place. Bernstein's final farewell to the State Opera happened accidentally in 1989. Following a performance of Modest Mussorgsky's Khovanchina, he unexpectedly entered the stage and embraced conductor Claudio Abbado in front of a stunned, but cheering audience. Beginning in 1970, Bernstein conducted the Vienna Philharmonic Orchestra, with which he re-recorded many of the pieces that he had previously recorded with the New York Philharmonic, including the complete symphonies of Beethoven, Mahler, Brahms, and Schumann. Also in 1970, Bernstein wrote and narrated a ninety-minute program filmed on location in and around Vienna, featuring the Vienna Philharmonic and such artists as Placido Domingo (in his first television appearance as one of the soloists in Beethoven's Ninth). The program, first telecast in 1970, on Austrian and British television, and then on CBS on Christmas Eve 1971, was intended as a celebration of Ludwig van Beethoven's 200th birthday. The show made extensive use of the rehearsals and finished performance of the Otto Schenk production of "Fidelio." Originally entitled, Beethoven's Birthday: A Celebration in Vienna, the show, which won an Emmy, was telecast only once on U.S. non-cable television, and remained in CBS's vaults, until it resurfaced on A&E shortly after Bernstein's death under the new title Bernstein on Beethoven: A Celebration in Vienna. It was immediately issued on VHS under that title, and in 2005 was issued on DVD. Bernstein was invited in 1973 to occupy the Charles Eliot Norton Chair at his alma mater, Harvard University, to deliver a series of six lectures on music. Borrowing the title from a Charles Ives' work, he called the series, "The Unanswered Question." It is a set of interdisciplinary lectures in which he borrows terminology from contemporary linguistics (most notably, Noam Chomsky) to analyze and compare musical construction to language. The lecture survives both in book form and DVD. In 1978, the Otto Schenk production of Fidelio, with Bernstein conducting (but featuring a different cast) was filmed by Unitel. Like the Bernstein on Beethoven program, it also was shown on A&E after his death and subsequently issued on VHS, though the video has since long been out-of-print, and there is no sign of a DVD reissue. 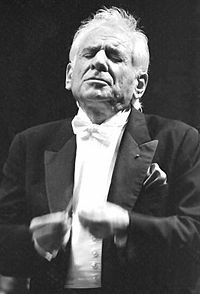 In 1979, Bernstein conducted the Berlin Philharmonic Orchestra for the first and only time, in two charity concerts. The performance, of Mahler's Symphony No. 9 was broadcast on radio, and posthmously released on CD. He received the Kennedy Center Honors award in 1980. On PBS in the 1980s, he was the conductor and commentator for a special series on Beethoven's music, which featured the Vienna Philharmonic playing all nine Beethoven symphonies, several of his overtures, and the Missa Solemnis. Actor Maximilian Schell was also featured on the program, reading from Beethoven's letters. On Christmas Day in 1989, Bernstein conducted Beethoven's Symphony No. 9 in East Berlin's Schauspielhaus (Playhouse) as part of a celebration of the fall of the Berlin Wall. The concert was broadcast live in more than twenty countries to an estimated audience of 100 million people. For the occasion, Bernstein reworded Friedrich Schiller's text of the Ode to Joy, substituting the word "freedom" (Freiheit) for "joy" (Freude). "I'm sure that Beethoven would have given us his blessing," said Bernstein. 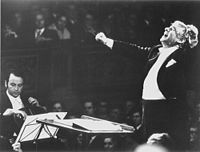 Bernstein was a highly-regarded conductor among many musicians, in particular the members of the Vienna Philharmonic Orchestra (of which he was an honorary member), the London Symphony Orchestra (whose members voted him Conductor Laureate), and the Israel Philharmonic Orchestra, of which he was a regular guest conductor. He was considered especially accomplished with the works of Gustav Mahler, Aaron Copland, Johannes Brahms, Dmitri Shostakovich, George Gershwin (especially the Rhapsody in Blue and An American in Paris), and of course with the performances of his own works. Regrettably, he never conducted performances of Gershwin's Piano Concerto in F, nor did he ever conduct Porgy and Bess. Leonard Bernstein died just five days after retiring. He conducted his final performance at Tanglewood on August 19, 1990, with the Boston Symphony performing Benjamin Britten's "Four Sea Interludes" and Ludwig van Beethoven's Seventh Symphony. The concert was later issued on CD by Deutsche Grammophon. Bernstein is interred in Green-Wood Cemetery, Brooklyn, New York. Bernstein recorded extensively from the 1950s through the 1980s. Aside from a few early recordings for RCA Victor, Bernstein recorded primarily for Columbia, especially when he was music director of the New York Philharmonic. Many of these performances have been digitally remastered and reissued by Sony as part of the "Bernstein Century" series. When Columbia lost interest in American classical recordings, Bernstein signed an exclusive contract with Deutsche Grammophon that continued until his death. "The Skin of Our Teeth:" An aborted work from which Bernstein took material to use in his "Chichester Psalms"
The Seinfeld character, Maestro, often refers to ideas that he learned from Leonard Bernstein. Speaking to composer Ned Rorem: "The trouble with you and me, Ned, is that we want everyone in the world to personally love us, and of course that's impossible: You just don't meet everyone in the world." ↑ Fred Karlin, Listening to Movies (New York: Schirmer, 1994). ↑ The Leonard Bernstein Office, Inc., About Bernstein. Retrieved May 8, 2008. ↑ Sony Classical, Biography on Leonard Bernstein. Retrieved May 8, 2008. ↑ Naxos, Ode To Freedom—Beethoven: Symphony No. 9 (NTSC). Retrieved May 8, 2008. All links retrieved June 26, 2018. 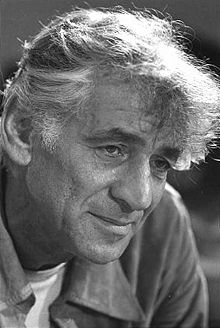 Donal Henahan, October 15, 1990; "Leonard Bernstein, 72, Music's Monarch, Dies", New York Times On this Day. "Leonard Bernstein", The Library of Congress. This page was last modified on 26 June 2018, at 19:02.